Frank Brown was born in 1907 and was living at 2 Windsor Street with his parents when this book was created. He was an apprentice Finisher in the Railway Works. 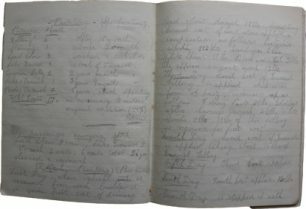 Frank created this book when he was 17-18 and contains notes from an evening class at the Science and Arts Institute on Carriage Building. It contains details on the characteristics and treatment of different timbers, cast iron, wrought iron and steel, screw couplings, paint, axles etc. At the back of the notebook Frank has written his homework tasks, one of which was, ‘Make a neat dimensional sketch of a carriage buffer’.